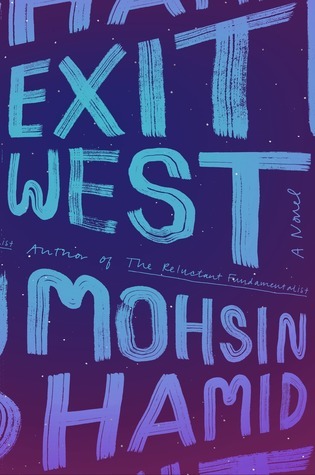 My first introduction to Mohsin Hamid’s work was an extract of Exit West, as published in The New Yorker. It enchanted me so much, I had to buy the novel. And when I heard Hamid would read in Amsterdam, I had to go to listen to him, too. The reading was held in De Duif, a church in the old center of Amsterdam. It’s a popular venue for weddings, funerals and concerts. Hamid joked that it might be the only time in his life he would speak from a pulpit. The reading was organized by the John Adams Institute and his interviewer for the evening was Naema Tahir. Tahir, like Hamid, is of Pakistani origin though she lives in the West while Hamid has opted for Lahore. There was a lovely moment when Hamid called her Naema and she told him he was the first in Europe to pronounce her name correctly. Hamid himself disputes his Pakistani-ness. His Urdu isn’t as good as it should be. Wherever he goes – whether to Lahore, London or Los Angeles – he identifies himself as the “freaky foreigner”. This used to bother him a great deal until he realized that he wasn’t unique in this regard. We all straddle multiple identities and cultures: gay among straight, black among white. The premise behind Exit West is the migrant crisis. Since 2015, over a million migrants have tried to enter Europe in search of a better life. Some survive the trip while others do not. The vast majority of these migrants are Syrian refugees. It’s tempting, then, to place the story of Saeed and Nadia in a place like Damascus or Aleppo, where militants battle for control. Yet Hamid makes a point of not naming the city where these young lovers meet. Rumors had begun to circulate of doors that could take you elsewhere, often to places far away, well removed from this death trap of a country. … A normal door, they said, could become a special door, and it could happen without warning, to any door at all. In Exit West, these doors work both ways. You could, for example, cross the border into the US for work and come back to find the daughter you had left behind. You might retrace your steps back to your war-torn homeland though who knew what you might find at the other end. Hamid says little about the journey itself and this is entirely intentional. That particular line comes from a section in the novel that shifts to a different main character and location. Hamid does these often and his point is to demonstrate just how widespread migration is. Here, we’re in the head of an elderly woman who lives in her family home in Palo Alto. Look at this craftsmanship. There was a rise that led up to the old woman’s street, and when she was a little girl the old woman used to push her bike up and then get on and zoom back down without pedaling, bikes being heavy in those days and hard to take uphill, especially when you were small, as she was then, and your bike too big, as hers had been. She had liked to see how far she could glide without stopping, flashing through the intersections, ready to brake, but not overly ready, because there had been a lot less traffic, at least as far as she could remember. This is the signature style Hamid uses throughout Exit West. The sentences are long, conversational in tone, yet slightly distant or even cool, as the passive tense can be. Like in this pivotal moment in the relationship between Saeed and Nadia. The civil war in their city has become increasingly dangerous, especially for Nadia as a woman living alone. Saeed urges Nadia to move into his family’s home. But part of her still resisted the idea of moving in with him, with anyone for that matter, having at such great difficulty moved out in the first place, and become quite attached to her small flat, to the life, albeit often lonely, that she had built there, and also finding the idea of living as a chaste half lover, half sister to Saeed in close proximity to his parents rather bizarre, and she might have waited much longer had Saeed’s mother not been killed, a stray heavy-caliber round passing through the windshield of her family’s car and taking with it a quarter of Saeed’s mother’s head, not while she was driving, for she had not driven in months, but while she was checking inside for an earring she thought she had misplaced, and Nadia, seeing the state Saeed and Saeed’s father were in when Nadia came to their apartment for the first time, on the day of the funeral, stayed with them that night to offer what comfort and help she could and did not spend another night in her own apartment again. Craft alert: that’s all one sentence. After the reading was over, I stood in line to get my book signed. Two lines from The New Yorker extract had stuck in my head. I quoted them to Hamid when it was my turn to talk to him. One’s relationship to windows now changed in the city. A window was the border through which death was possibly most likely to come. Oh yes, Hamid exclaimed. That line came from an incident with my contractor. Hamid and his wife had just moved back to Lahore and were in the process of renovating their house. The contractor wanted to know whether he should coat their windows and glass doors with something called Bomb Blast. Apparently, the coating holds the glass together, sparing those inside from death by flying shards. I’ve never thought before of what it must be like to live in a war zone. That’s what reading does for me: a form of armchair travel that opens a window into the human experience. Many of the scenes in Exit West are, luckily, far from my own life. But as a lifelong migrant, the emotional thread speaks to me. when we migrate, we murder from our lives those we leave behind. For all those I’ve left behind, read this book. May it function as a door between you and me so that someday soon we will meet again.